Ascent Systems Technologies achieved a significant milestone and made an important step toward its goal of creating uninterrupted source of clean energy. On May 16, 2017 it began installation of the Integrated Thermal Hydronic System (ITHS) at the Centre for Interactive Research on Sustainability (CIRS) at UBC in Vancouver. The system consists of a solar collector as a primary energy source, a thermal energy storage and an auxiliary energy source. The solar collector is installed on the specially designed mount attached to the rooftop platform. The unique design with the axle allows adjusting its azimuth angle and vary angle of inclination in a range from 0 (horizontal) to 90 (vertical) degrees or even be flipped backwards. The integrated system will include embedded irradiation sensors and real-time environment monitoring capability. Within the next few months the system will be fully configured, after which testing will start at different angles, various environment conditions and using alternative control methods. When fully tested, brained with the advanced control algorithm developed in collaboration with the University of British Columbia, the system will be ready for deployment in the field. Thanks to the optimized system architecture it can be configured as a fully self-contained autonomous module capable of generating clean energy 24 hours 7 days a week. Fit in a small shipping container or a trailer, such a module could be delivered to practically any remote location. Once on site, it could immediately start generating energy without the need for fossil fuel or for being tied to the grid. Multiple modules deployed at various geographical locations will be connected in an intelligent grid for performance data collection and analysis as well as climate monitoring and solar mapping. 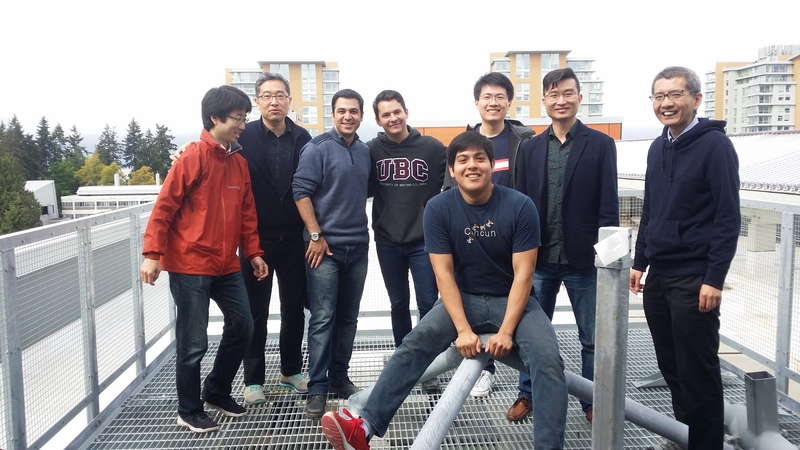 Prof. Ryozo Nagamune of UBC (right) and his team of students helped moving the mount to the rooftop platform.